A letter to Joe Lacob and Peter Guber as the 2017-18 season gets underway. Thanks, Joe and Peter, for finally paying your parade bill. But why moan and groan about it? Congratulations on achieving the impossible. You’ve transformed the NBA’s biggest laughingstock into its greatest franchise, featuring a fearsome roster that wins titles and earns huge profits. Your home — Oracle Arena in Oakland — is a cash cow and provides the Warriors with the NBA’s best and loudest home-court advantage. And you two, Joe and Peter, deserve so much of the credit. Just about everything you’ve touched has turned to gold, illustrated best by your hiring of the league’s best minds in general manager Bob Myers, head coach Steve Kerr, and executive Jerry West (since departed to the Clippers). You’ve reaped the benefits of countless wise business decisions. That’s why it’s so hard to figure out why you’re now making the biggest mistake of your tenure; one that could irreparably wound the Warriors franchise. And I’m not referring to the questionable move across the Bay Bridge. Not specifically, anyway. I’m talking about the conspicuous lack of respect — sometimes outright condescension — you’ve been showing the city of Oakland in your final seasons in the East Bay. Let’s start with the most recent news: that you finally made good on your promise to pay the city’s championship parade costs in June — but did so belatedly and it seems begrudgingly. Instead, you unleashed a sneer amid the supposed generosity, revealing the snobby views of an elitist whose skewed perception of Oakland stems not of pride from its many strengths, but of a patronizing pity over its “share of issues.” Thanks for nothing, Joe. Who wrote that whiny press release? Sean Spicer? 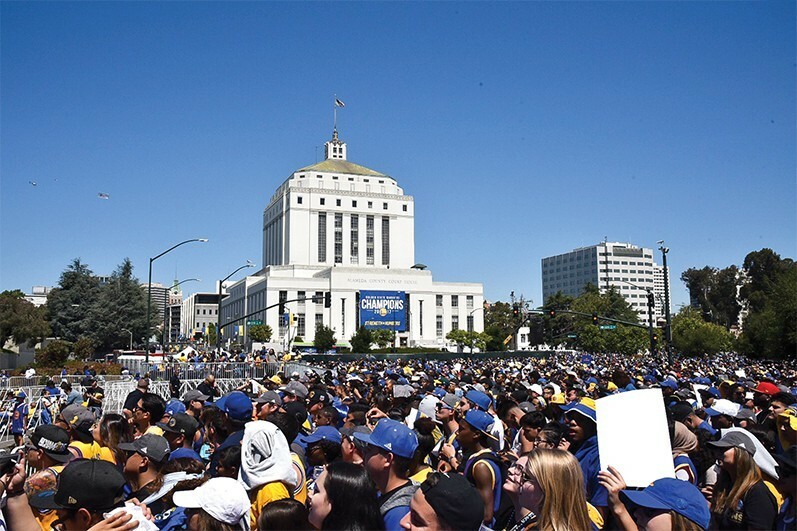 Lastly, Joe and Peter, this petty parade beef clearly was the undercard to the main event: your anticipated battle against the city of Oakland and Alameda County for the roughly the tens of millions you’ll owe them after leaving Oracle in 2019. For some reason, you seem intent on starting a feud with East Bay taxpayers over this. To which the only rational reply is: Are you out of your mind? An unnecessary squabble will bring nothing but bad publicity — which you can’t afford a speck of when you leave your Oakland home of nearly 50 years for San Francisco in less than two years. The initial bills of your privately financed arena will be too high and your betrayal of Oakland too obvious for you to pick that fight. To be fair, you’ve been generous to Oakland on several fronts, giving to charities and spending to refurbish East Bay public parks and basketball courts. Donning new “The Town” jerseys this year might be too little, too late, but it’s also respectful and shrewd, at the very least. You deserve credit. All that said, zip code envy is never a good look. Neither is refusing to pay your Oracle Arena tab. So, word to the wise: Don’t dine and dash on East Bay taxpayers. Pay your bills. Especially when doing so won’t even dent your bottom line. I know right now that’s hard to imagine. You’re on top of the world, moving soon into deluxe city digs, and still light years ahead of your NBA peers. But that’s part of the problem. Things are so good now at Oracle Arena in Oakland, there’s nowhere to go but down. A fall of some kind in San Francisco — though years away — is inevitable. There’ll come a time when your new tech-bro fan base deserts you and once again you’ll need your Oakland die-hards. So, when you hop on I-80 West for the last time in 2019, it would be foolish to burn that bridge behind you. Think of the Oakland fan base — which you soon will miss in ways you cannot fathom — as your current spouse and the city’s politicians as its parents. You might not like your spouse’s parents. You might even think they’re batshit crazy. But you treat them with respect because it just comes with the territory. Do the same thing with Oakland leaders and the tax dollars they’re paid to manage. Improve your tone, pay your fair share, and show some basic courtesy to a city that’s shown you nothing but love and loyalty for a half-century. Then you might just pull out another dramatic victory for the Warriors at your new home. Chris De Benedetti writes an occasional sports column for the Express.